BHOPAL: In a huge loss to literary heritage, thousands of rare books were damaged when the historic Iqbal Library was inundated on Saturday evening. Thousands of books including ancient texts that are kept in the library, were damaged. This non-governmental library, that has a huge collection of books is a unique institution that has catered bibliophiles for nearly eight decades. During thundershowers, the drainage chambers below the library suddenly exploded and huge quantity of water entered the library which is located in the midst of royal complex in Bhopal. Within minutes everything was floating--from coolers to chairs. There was 4-5 ft water and as a result almirahs were amid water. Rare books that survived ages in the library, were damaged. The civic body is being held responsible for the lack of maintenance and diversion of sewage water, which caused the situation. 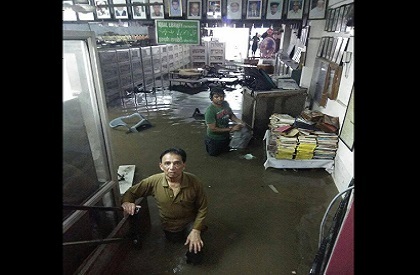 The library in-charge Rashid Anjum, who is an author of three dozen books, and other staff along with book lovers were seen trying to save the books but to no avail. They were in a state of shock, in tears. Playright and author Rafi Shabbir was making frantic calls to everyone to rush to the library and save the books. The library has a huge collection of books in Urdu, English, Hindi, Marathi, Sanskrit and has catered to literature lovers as well as students. Iqbal Library is located in the heart of the Walled City. Visitors to Bhopal always expressed surprise at how this private run library that has a reading room too, attracted so many readers. In the evening the reading room is mostly packed. The library was set up in 1930s. Fund crunch has been a big issue. However, many people spent precious years of their life with the institution. Several members of the staff take nominal amount (some of them don't take even the honorarium) and work for hours in the evening. It is this dedication that has ensured that the library has survived for such a long time. A special meeting of library management and citizens would be held on Sunday to chalk out the plan--how to save the damaged books, about shifting books to a new place and future course of action after such a big calamity.